Cyclingnews: Ernesto, can you tell us what it was like in your original workshop, which cycling writer Rino Negri called a 5 meter by 5 meter closet? Ernesto Colnago: Well, fifty years ago, most of the work on bicycles was simple: to repair tires or change the chain or adjust the brakes…on normal bikes. There was no real specialization in racing bikes…I tried to bring the work of the simple bicycle mechanic out of the basement and focus on the racing scene. We decided to focus mostly on racing bicycles, even if we still did some repairs on normal bikes. CN: I’ve noticed the difference between the design of bicycles made before WW2, like Bartali’s Legnano and the post-war bikes, such as Coppi’s. Can you discuss the evolution of modern bicycle design at that time? 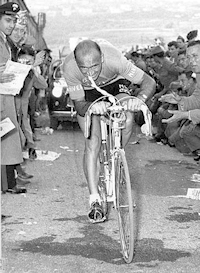 EC: Certainly, I remember when I did my first Giro d’Italia as a race mechanic in 1955, I saw many riders with a very big frame and a very low saddle, which was the old style, from before the war. They looked bad on the bike and weren’t very comfortable. So I said to some riders on the (Nivea-Fuchs) team ‘I’ll make you a smaller frame that will be more rigid and lighter, with the saddle out a bit more’. The bicycle frame is made of two triangles, in front and in back. What is the basic concept of a triangle’s shape? Strength… so if I reduced the size of the frame triangles, they would gain rigidity and transmit more power. For example, back in the early fifties, if a rider had a 58cm frame and the saddle was out of the frame 8cm, I realized it would be better to have them ride a 58cm with the saddle out 10cm. You understand? So that’s how I created a frame that became the moda. It was nicer to look at, a slimmer, better-looking design. CN: So your approach to bicycle design in the mid-fifties was a smaller, more rigid yet lighter frame? EC: Yes, I started to build smaller more rigid frames. Not so low like the sloping designs today that comes from mountain bikes, but we re-scaled the frame designs so riders could us a smaller frame with more of the saddle out. That was my first real theory that I applied to bicycle design and it was appreciated and then adopted widely. EC: Because the roads were bad! CN: So with the improving roads after WW2, how did this change your approach to bicycle design? EC: Well if you take one of those pre-war frames, I don’t know which, the chainstay length was 47 or 48cm. Now it’s 40.5cm. The rear wheel was very far from the seattube, 6 or 7 cm. Because the roads were bad, so the wheels were placed farther apart to absorb more shock. But the bikes were slower with that geometry. (Colnago reaches under his desk and pulls out a prototype carbon fibre frame to illustrate his point on frame design) But if the wheels of the frame are closer together, the bicycle responds better to a jump. CN: When you presented your 2004 Colnago range at the Interbike show in Las Vegas last October, you spoke of your passion for creativity in bicycle design. Where does this drive come from in Ernesto Colnago? EC: I’ve had this since I was a child… I always been fascinated by bicycles from an early age. I was one of the first kids to have a bicycle in my neighbourhood… it had 24″ wheels. It was a used bike and I used it to ride around all the local roads when I was 10 or 11 years old… most of the roads then weren’t paved, farm roads, but I went all over the place. I used to ride down to Gorgonzola (20km south of Cambiago) with my cousin to see some bike races, there used to be two or three a year that we would go to. We’d see the riders with their racers legs, with the tubular (tires) on their shoulders, their water bottles in aluminium, their racing shorts. I always liked that very much. By 1944, I was already helping out at an officina in my neighbourhood owned by Dante Fumagalli. I was like a general helper there. I really wanted to learn… so I didn’t get paid anything and my family gave Fumagalli 2 kilos of flour every week from our farm. It was wartime and finding food to eat wasn’t that easy! I really liked the work but was too young for Fumagalli to hire me. After this, I was very lucky to get a job in a bicycle factory when I was still 13, at Gloria, viale Abruzzi, 42 and from that, it’s been my life. CN: What was your first job like at Gloria? EC: Well it was like I had a camera for eyes then. Everything I saw, I memorized. Everything I saw. I can tell you everything about that time! I began my job at Gloria on 25 November 1945, Saint Catherines Day. It was snowing that day and I took the streetcar into Milano. I was too young to work at that time; the law said you had to be 14 years old, but since the war had just finished, and my friend Luigi Oggioni, who was already working there told me Gloria was looking for young boys to work in their factory. They liked me and offered me a job and I had falsified my ‘libretto’ (working papers) so I could work. The office manager, Mr. Angoletto hired me and my first job was as a welders assistant (garzone). My father bought me some overalls because he wanted to make sure I had the same as the other guys. But they were a little big on me. I had to roll up the sleeves and pants…one day, my sleeve got caught in a lathe while it was turning and almost ripped my arm off! Anyway, at Gloria, it wasn’t like my bicycle factory of today! Oh no… it was sixty years ago. There was no ventilation or anything. The workshop at Gloria had a low ceiling, it was full of smoke. So my job as garzone was to put the frame on a workbench and the welder, his name was Sozzi, brazed the frame. While he was doing that, I had to position the frame as needed so Sozzi could braze each part. Sozzi was a hard-headed guy; he told me ‘Hey! When you work with me, don’t make any mistakes. Be very careful of what you are doing.’ So I followed his instructions exactly and after a few days I eventually got it down. But when I was a 13 year old kid, I was interested in everything. So someone would go by with a fork, or something else and I’d be looking. In those days, the welders did piece work (a quoti). They would get paid by how many frames they could complete. So if you made a lot of frames, you could make a lot of money. So a welder needed a good garzone to make money, and one time when I wasn’t paying enough attention, Sozzi ran the lit welding torch over the back of my hand. I got burned a bit and had to put some cream on it, then Sozzi said to me ‘Watch out… you have to pay more attention’, and the other workers agreed with him, saying ‘you made a mistake; you have to learn to pay more attention to what’s going on in front of you.’ That was a tough school to learn in at 13 years old, but I did. Over the next two years, I learned all about brazing frames and forks but eventually, since I had stared to race bicycles, I asked (Gloria) to find a healthier place for me than the brazing workshop. So they sent me up to the third floor where the bicycles were assembled. That was a healthier environment. I would train better, since there there was no smoke. So my career at Gloria was good experience to learn brazing and assembly and by 19, I was (capogruppo) of an assembly team of 12 workers. Gloria sponsored a professional team at that time which was inspiring for us. 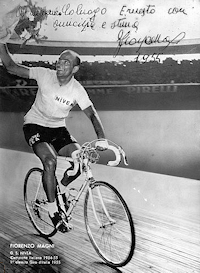 In 1950, I won the Coppa Mamma Isolina Caldirola and a dozen other races but eventually realized that I wasn’t going to be a big champion. I was a good sprinter and probably should have ridden the track. So I worked out a deal with Gloria where they sent me frames and wheels at home. It all started from there in that little 5×5 workshop. I bought more tools and started to repair bicycles along with my piece work for Gloria and got a good reputation as a ‘precise mechanic who didn’t pull any tricks on anyone’. At the same time, local teams began to look for bikes that fit better, and were of a better quality so I started to build the first bikes under my own name that year, it was 1954.